Time Out Dubai is a free Windows 8 Dubai app that tells you what kind of fun you can have if you are living in beautiful Dubai. This is a kind of Windows 8 app you should definitely use if you are staying in Dubai or if you are planning for a trip to Dubai. This app for Windows 8 here, will lead to the best place for hanging out in Dubai. 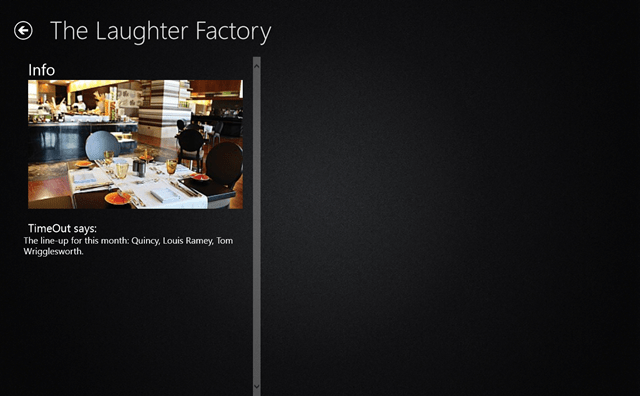 This Windows 8 Dubai app lets you know about everything around you. You can know whatever you want if you are getting bored and don’t know how to become a party animal in Dubai. 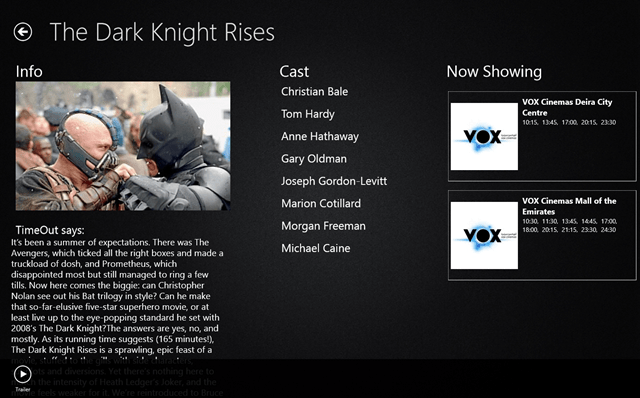 Just switch on to this Windows 8 app and check out your favorite movies running at your nearby theaters, awesome restaurants near you, and cool places to hang out. You can also get the movie timings and the nearby cinema house. This is how the interface looks like with all the tabs at the side that tells you the best place to hang out, have delicious cuisine, and try the night life of Dubai. You can also check out hotels if you want to stay there for sometime or if you want some place to crash. This app for Windows 8 is a travel guide for you if you are new to Dubai. 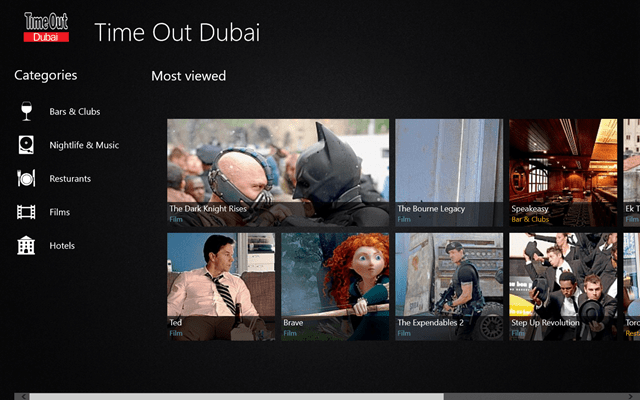 The main purpose of this Windows 8 Dubai app is to show you the timings of the local movie theaters and cinema house playing your favorite films. You don’t have to bother if you are new there and you don’t know how to reach, Time Out Dubai app will help you. Besides that, you can also get the other info related to your favorite movie like the cast & crew and can also watch the trailer over here. You can simply get all the information about various local restaurants and bars to hang out and can check out various discotheques and hotels. It will guide you to the best places there and can also inform about various events to be held there. Time Out Dubai will surely help you as a friend in Dubai. Do not miss out our post on Windows 8 GPS App. So don’t wait, if you are new in Dubai then just download this amazing Windows 8 Dubai app on your Windows 8 desktop and have fun.